The GREY FRIARS GUILD commenced in 1984 and we have just completed our 30th Year of operation. We have over 50 members (all aged 60+) and currently we meet at the Wilson Marriage Centre for Adult Community Learning in Colchester. The Guild commenced in 1984 and was supported by the principal and staff of Grey Friars when it was the Adult Community College in Colchester. The Guild catered for retired people and one prerequisite was that to be a member you had to be actively learning, either attending an adult education class at Grey Friars or one of its satellites, or involved in a self-managing learning group. We met in the elegant Main Hall at Grey Friars every Friday morning for an interesting talk usually by an outside speaker, followed by a lunch and a range of afternoon activities to choose from, and some special classes were arranged for Guild members. When there was a threat of closure of Grey Friars, in the 1980s by Essex County Council, the Guild were among the foremost protesters to keep it open. Again when closure was mooted in 2006 the Guild protested against it. I was Head of Science and Maths and Open Learning at Colchester Institute and I worked with Alan Skinner, the Grey Friars Principal at the time, on a joint prospectus and because we had the facilities to offer GCSE and A-level Sciences in the evening we liaised on the programme. When I retired in 1995 I joined the Grey Friars Guild and attended a range of European language classes (French – German – Italian and Spanish). The classes were excellent and all taught by foreign nationals. One feature of some of the classes was the presence of some students with learning difficulties and some physical disabilities. Because of this I joined the newly formed Lift Fund (I had done a disability audit for Colchester Institute) which later become the charity CALCAG (Colchester Adult Learning Continuing Access Group) then CALA (Colchester Adult Learning Assistance), but that is another story. 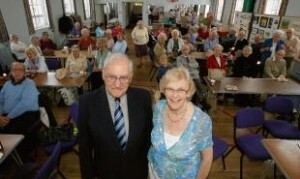 When adult community learning in Colchester was moved by Essex County Council to Wilson Marriage in 2008 we transferred the Guild and retained most of our membership. We meet in what was the school gymnasium which has the advantage of being self -contained with good toilet and kitchen facilities. I am currently Programme Secretary for the Guild my wife (Mavis) is the Chair and the majority of the membership have very fond memories of Grey Friars and the diversity of classes they were enabled to attend. The book is an excellent account of Grey Friars and all who “sailed in her”. For so many people reaching old age can lead to isolation. As life expectancy rises, groups, like Colchester’s Grey Friars Guild, whose members are mostly over 70, will become increasingly important. The Guild, based at the Wilson Marriage Centre, in Barrack Street, has celebrated its 25th anniversary. During a celebration party, members spoke about how important the social and educational events were in their lives. Despite moving from the centre of Colchester, two years ago, the guild has a healthy membership of 65. Members have to enrol at the Wilson Marriage Centre, an adult education centre, or one of its satellite offices, for at least one adult education class during the academic year. The Guild arranges some of these classes, such those covering horticulture and art. Through signing up to the class, members can then enjoy the full range of activities offered by the Guild. These include a programme of speakers on topics such as poetry and prose and Essex houses. Garden parties are also held in the summer so members can stay in touch. * Membership costs £10 a year, which is the guild’s main source of funding. To join, contact membership secretary Marion Cuming on 01206 330019.